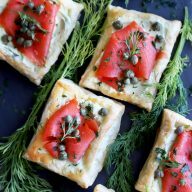 My Favorite Valentine’s Day Menu Ideas are a collection of five menus that will please every palate. 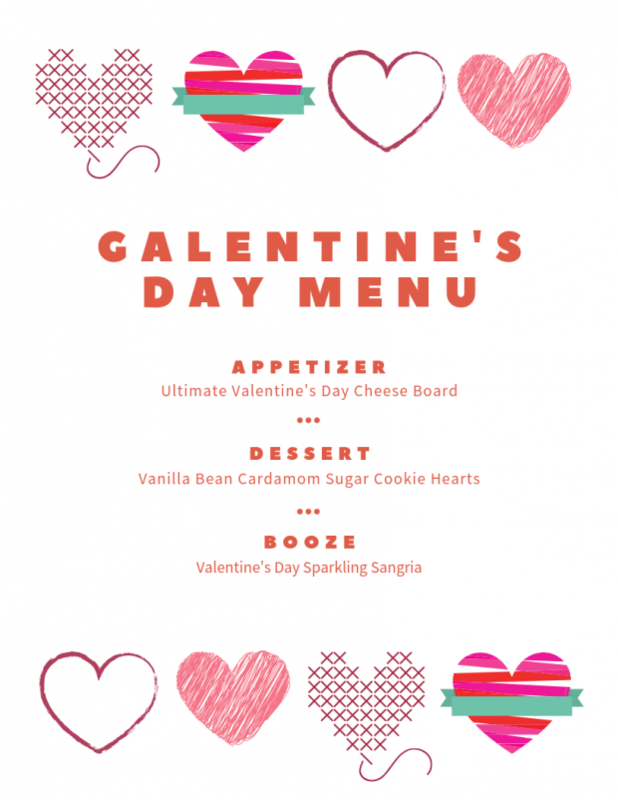 Whether you are making a meal for that special someone or hoping for some bites to celebrate Galentine’s Day, these menus are for you! After all, the best part about Valentine’s Day is the food, right?? For the Man and I, Valentine’s Day is not really a giant over-the-top celebration like most other holidays are. We tend to use the day as an excuse to spend some quality time together, and what’s more special than spending time together over a meal? I really wanted to round up some new and fun menus for you all this week, just in case you don’t have a big night out planned. 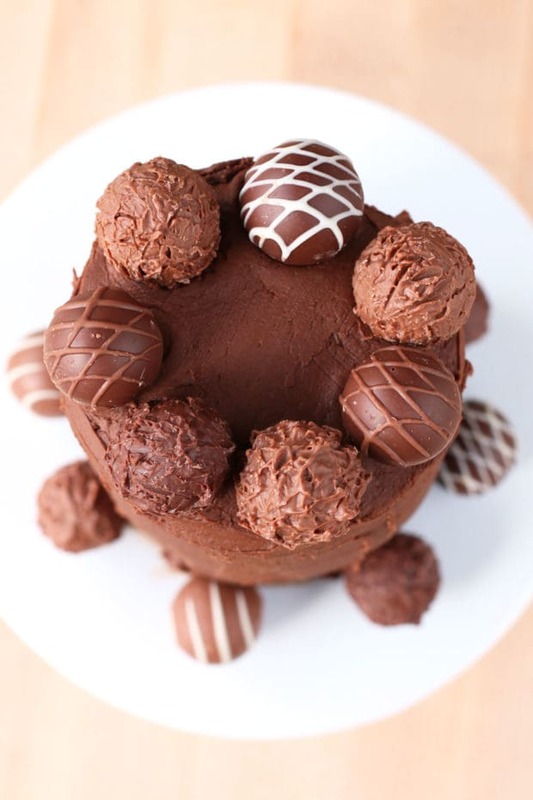 So here are my 5 favorite Valentine’s Day menu ideas! There’s a little something here for everyone! Hopefully it’ll either inspire you to cook, or perhaps it’ll help solve your worries of what to make for your loved one next week. 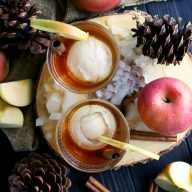 First, I am sharing my favorite sweet and savory bites, along with a boozy sangria for your Galentine’s Day gathering. 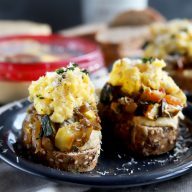 These recipes are perfect for getting your gal pals together to celebrate your general fabulousness! You all can graze away on the Ultimate Valentine’s Day Cheese Board that features chocolate covered fruit. 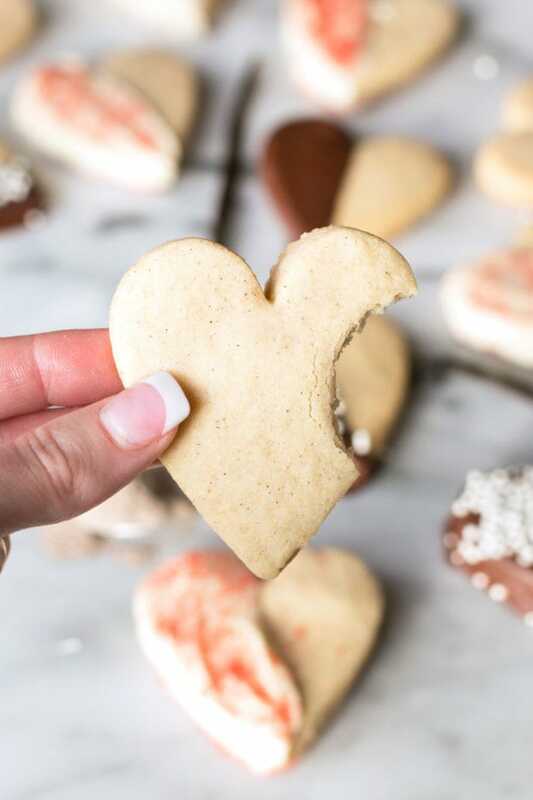 You can sip on Valentine’s Day Sparkling Sangria and indulge in easy Vanilla Cardamom Sugar Cookies for the best celebration ever! Second, for those of you who want to go over-the-top with your cooking chops, I’ve got a fancy menu for you to indulge in. Don’t want to spend a lot of time in the kitchen? Never fear, because my third menu has you covered with the easiest dinner menu EVER, that’s also so romantic. 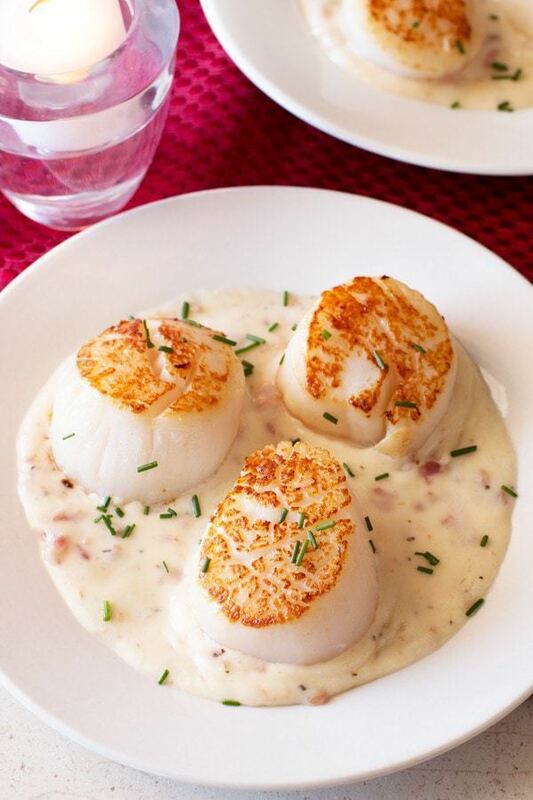 For those of you who want something simple to make, you’ll start with quick and easy Pan Seared Scallops with Bacon Cream Sauce. 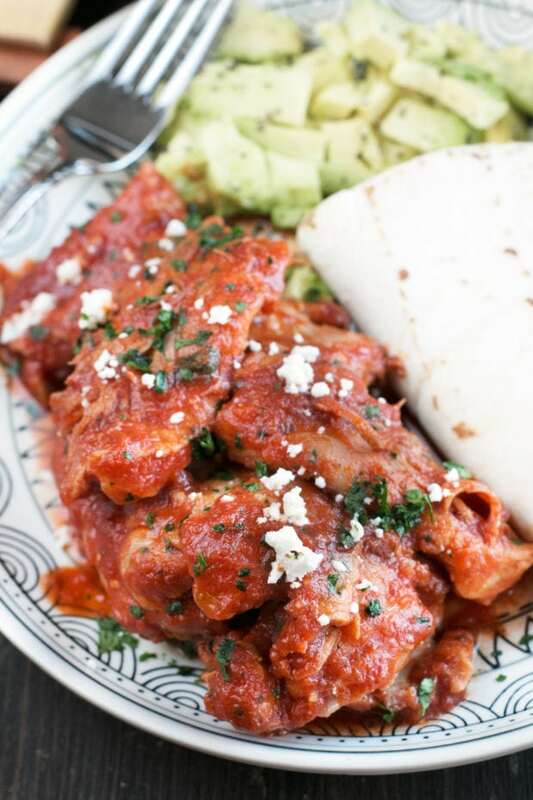 Next you’ll dive into Chipotle Braised Chicken Thighs that you can serve with rice and beans, or even as tacos if that’s what your boo loves. 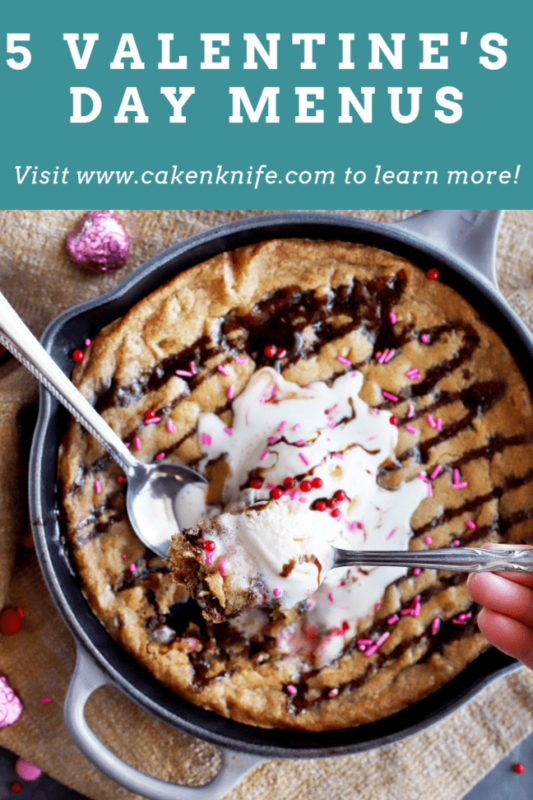 Finally, Valentine’s Day Pizookie for Two gives you a gooey chocolate finish we all crave on the holiday. 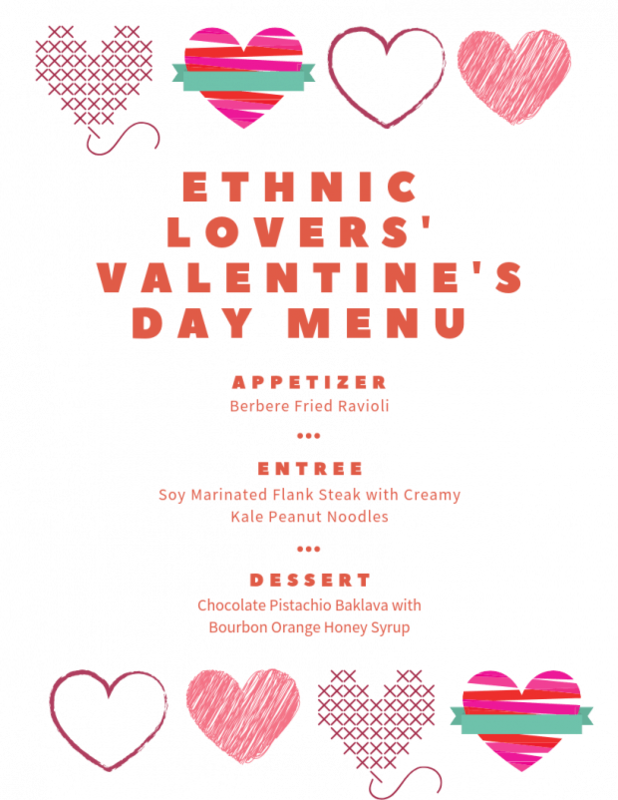 Fourth, for those of you with adventurous palates, you will adore the flavors in my ethnic roundup menu. Adventurous palates of all kinds will love the crunchy heat of these Berbere Fried Ravioli. 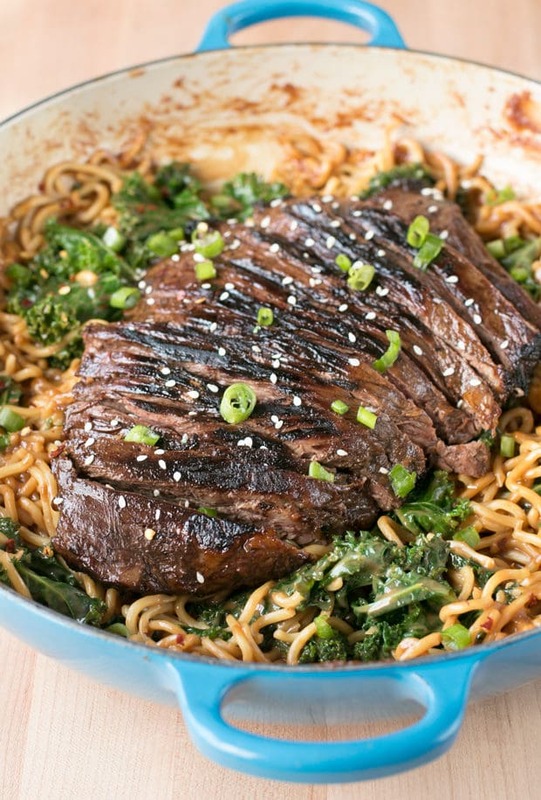 Soy Marinated Flank Steak over Creamy Kale Peanut Noodles is still the Man’s fave recipe I’ve ever made for him – it packs a serious punch of flavor! Finally, surprise him/her with Chocolate Pistachio Baklava with a drizzle of Bourbon Orange Honey Syrup. Finally, if you want to have a picnic (out in the park for those of you in warmer climates, or simply in your own living room if the weather is chilly! 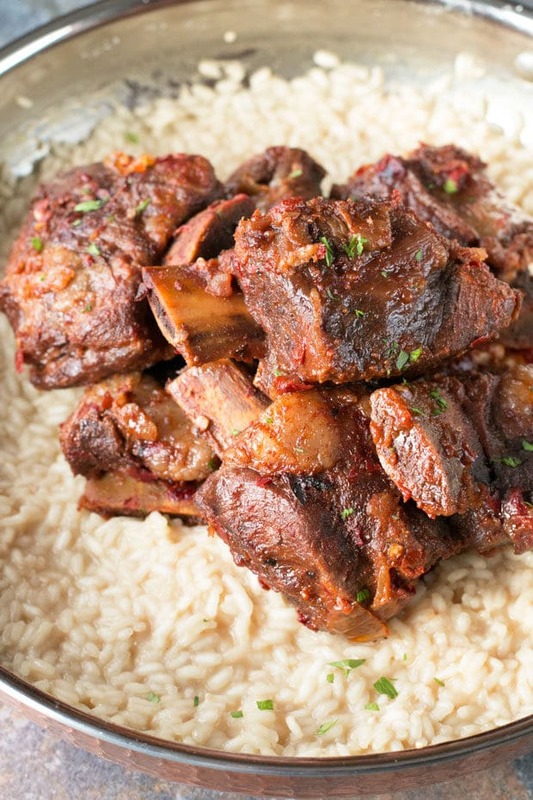 ), I have a go-to menu that never fails to impress. 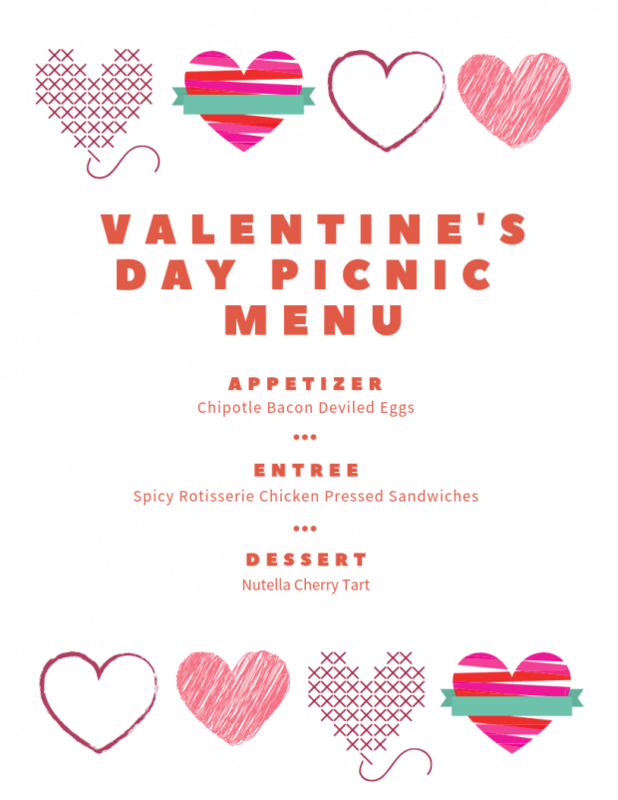 To me, picnics are the ultimate way to celebrate Valentine’s Day. It’s a different way to cuddle up over a meal and you can have said picnic inside or outside! These recipes are ideal for picnics because they can be served chilled or at room temperature. Plus the Chipotle Bacon Deviled Eggs, Spicy Rotisserie Chicken Pressed Sandwiches, and Nutella Cherry Tart all can be made the day before! The only question is, which one will you make for Valentine’s Day this year?! 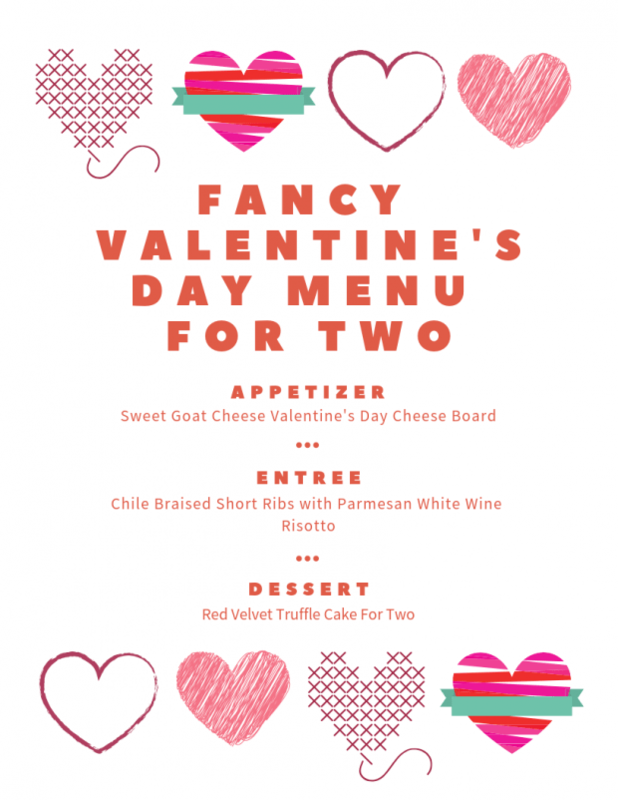 There isn’t much you need to make Valentine’s Day special for your boo! Do they love flowers? Give them a gorgeous bouquet in this stunning Marquis By Waterford Markham Vase! Setting the mood to me means CANDLES CANDLES CANDLES. This BOLSIUS Tray of 20 Ivory Pillar Candles is an awesome deal! – that aren’t too pricey! Want to really make them feel special? Set the tone with a flourish of Red Silk Rose Petals on the table, on a picnic blanket, or even on the bed 😉 Plus you won’t feel like you are wasting real flowers!